Description: Subject is the daughter of the one time Chronos archaeologist Dr. Marcus Edwards. Before the ACTF was formed Guyver US met Cori Edwards who brought Sean to their dig site where they together soon discovered a buried Relic Craft. Chronos too revealed their presence and in the resulting battle Guyver US defeated the Guyver Zoanoid with the help of Cori who shot the already damaged control medal of the Guyver Zoanoid forcing it to go rogue giving Guyver US the chance needed to defeat his foe. Years later Cori who was now romantically involved with Sean Barker joined the newly formed ACTF. Here she has lead research into these Living Relic ships that lay dormant underground. As part of that research it was decided to bond her with one of the few prototype Units that were created in the development of the Warrior Unit. This prototype is equipped with what is most probably the first functional HSL system and an advance shield system which produces a combination body/blast field shield. As the subject’s primary power, the shield has proven itself much more flexible than the Warrior Unit’s and can be used as both a shield and weapon simultaneously, making subject a great asset despite the fact she has only half the power of the Warrior Unit. Psychological Profile: Subject is an academic first and a soldier last. She is a natural problem solver and is more focused on her work than in combat. She has no natural drive to fight but that can be made up with her will to fight Chronos for what they have done to her father by making him into a zoanoid and later killing him. She usually accompanies her boyfriend Sean Barker on missions. She has shown her loyalty with the ACTF by staying with us even when Warrior Guyver left along with many of his friends. Subject’s physical strength has been estimated to be twice as great as a standard Guyver’s, granting the subject the approximate strength of 200 men. Subject can channel her shield energy into her physical blows to equal up to a Warrior Guyver’s equivalent. Normal ground speed is ~450 MPH and normal flight speed is ~600 MPH. However the advanced and versatile shielding system allows the subject to channel energy from her shields into boosting her max. ground speed up to ~750 MPH. Flight speed is further enhanced as the shielding system further enhances the gravitational power of the unit, boosting speed up to ~3,000 MPH. Reflex speed is 10 to 100 times normal human peak. Unit’s armor durability appears to be equal to a standard Guyver. Defense is further augmented by a continuously generated body shaped shield aura that allows subject to survive anything up to a full double mega smash level attack with minimal damage and can reinforce subject’s physical integrity when necessary. Regeneration is the same rate as a standard Guyver’s but by channeling shield power it enhances regeneration speed four times faster than a standard Guyver’s regeneration rate. The subject can also use and maintain a blast shield, normally produced by all Guyvers only upon activation, at will, to allow subject to withstand an attack of up to five times more powerful than a standard Guyver’s full double Mega Smasher. A second energy shield, produced with a combination of the Unit’s gravitational power and blast field, can be generated to quadruple total shield strength and allow the subject to withstand anything up to 12 times the destructive power of a Mega Smasher. The subject can create and maintain a Pressure Cannon as a directional shield, which she can focus the power of her other shields to produce a directional defensive field capable of letting the subject withstand anything up to 20 times the power of a standard Guyver’s Mega Smasher blast by deflecting the majority of the beam around the subject. The Pressure Cannon by itself can only provide a directional shield capable of deflecting an attack equivalent to the power of four combined standard full double Mega Smashers, by refracting most of the energy around herself. The unit possesses slightly enhanced hyper sensors compared to a standard Guyver’s that provides a system similar to a HUD (Head’s Up Display). Providing the host with tactical information and keeping track of both friend and foe activity with ease. This combined with the unit’s own 3D sensory orb system, the roving metallic orbs located on either side of the subject’s head, grants subject a near omnipotent awareness of her environment. Optimum active scanning range is 366 meters (~1,200 Feet) and ten times that with passive scanning. The Head Beam Orb is an infrared laser emitter, which channels the internal thermal energy of the unit as a directed energy beam which combined with the unit’s enhanced power has four times the power of a standard Guyver’s. Unit possesses a single pair of forward facing vibrational swords that are equal to a standard Guyver’s. However the vibrational swords benefit by being directly connected through the shielding system, allowing the subject to channel shield energy into them to create focused attack on a target. The swords have been seen to pierce some shields of certain lower level hyper zoanoids. Only the Warrior class polymorphic swords can withstand this attack. The subject can combine her shield energy through her kinetic momentum organs and through her fist to create a powerful energy enhanced physical attack either as kick or a punch that is approximately as powerful as a Gigantic Guyver’s gravity knuckle attack. Between the subject’s greater than normal power level and the more advanced gravity control orb the subject can generate pressure cannons five times more powerful than a standard Guyver’s. The subject can channel her total gravitational power into a single large pressure cannon making it five times more powerful than normal. –MEGA PRESSURE CANNON: Subject has the ability to channel his bio-energy and body shield energy to super charge a pressure cannon and boost its destructive power to the equivalent of a standard Guyver’s full double Mega Smash. A powerful attack but, since it draws its power from the subject’s bio-energy and body shield, it can leave subject vulnerable to attack while charging up for this attack. 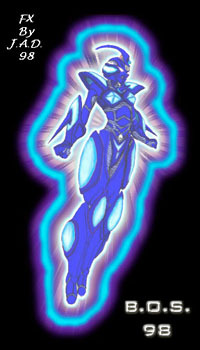 –POWER WAVE: Subject can channel the total power of her gravitational, energy shields, bio-energy, and blast field power into a directed blast that can be either fired two handedly, at two different targets, delivering up to the destructive power of a normal Guyver’s single mega smasher to each target, or into a single beam equal to twice that destructive power. The only downside to this ability is that it draws its power from the subject’s defensive systems and so makes subject more vulnerable to attacks when used. Subject’s mega smashers appear to function within the same parameters as a standard Guyver’s. However, the subject can channel her the power of her shields into her mega smasher cells to enhance them to five times their normal power. The downside to this is that it leaves the subject open to attack and takes slightly longer than normal to charge. The unit’s sonic busters appear to function within the same range and power as a standard Guyver’s. The subject can use her shields to allow her sonic busters to operate in space but only at close range. Subject is one of the main users of the Aceaer units that the ACTF possesses. The Aceaer unit acts like an upgrade that effectively enhances all the powers of the subject. Like the Warrior Guyvers, the Aceaer benefits from the unit’s advanced HSL allowing the upgrade to enhance the subject by 60% instead of the expected 50%. The Aceaer had limited regeneration capabilities and could detach from the subject it the unit received too much damage for it to heal.